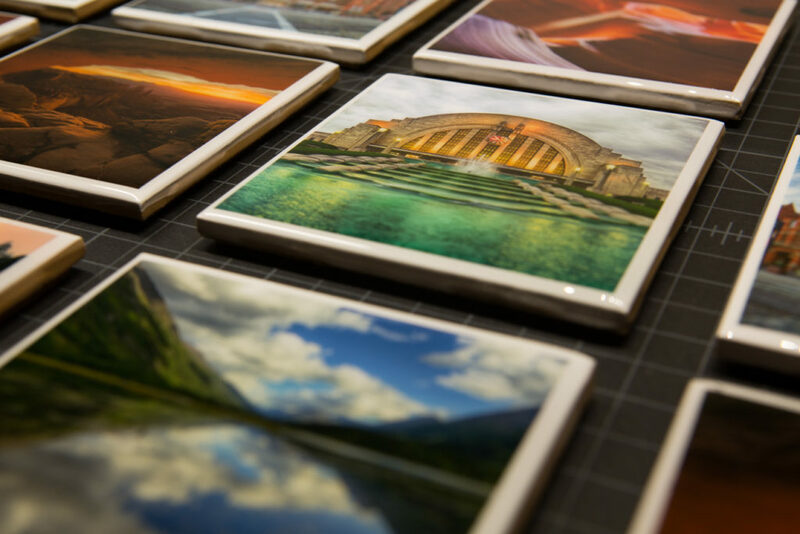 In the search to create long lasting and usable photography products, I began experimenting with various methods to create art for tabletops: photo coasters! I wanted them to be able to withstand hot mugs, liquid condensation and still retain photo clarity over time. After experimenting with a variety of applications and materials, I discovered epoxy resin was the best solution. These beautiful, and functional, pieces of art make for great gifts and have been a hot selling item in my gallery for the past several years. I’d like to share my process with you and I hope you find this tutorial useful for your own business or DIY home decor needs. I prefer using 4”x6” high-gloss sheets since there is less cutting involved. 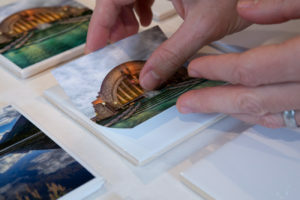 Most major printer companies (Canon, Epson, or HP) offer a high-gloss paper that is more plasticized than porous; these are ideal because you don’t have to worry about the resins or adhesives soaking into the print. But feel free to get creative and try different types! Once you have printed the image, cut each sheet down to a square (4”x4”) that fits your intended ceramic tile. This is an important step, it will save the headaches later when removing cured drips of resin from the bottom of the coasters. Using a standard scotch tape, apply strips to all four edges on the bottom of the ceramic tiles. Trim off any excess that hangs over the edge using a sharp knife or X-Acto blade. Step 3: Clean the top surface of the ceramic tiles. Tiles are often dusty from their shipping packages. We want to eliminate any chance there is debris, which may cause air bubbles, between the surface and the adhered print. Using a streak-free glass or surface cleaner, set the tiles face up and wipe them down with a lint-free cloth or paper towels. 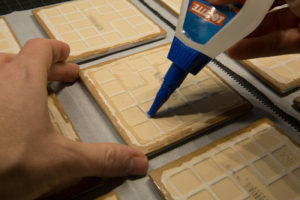 Step 4: Apply thin layer of clear-drying acrylic decoupage glue. I’ve found that Mod Podge works really well for this step. 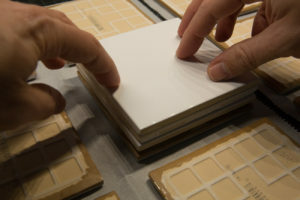 Using a 1” or larger acrylic or smooth-bristle brush, evenly coat the top surface of the tile. 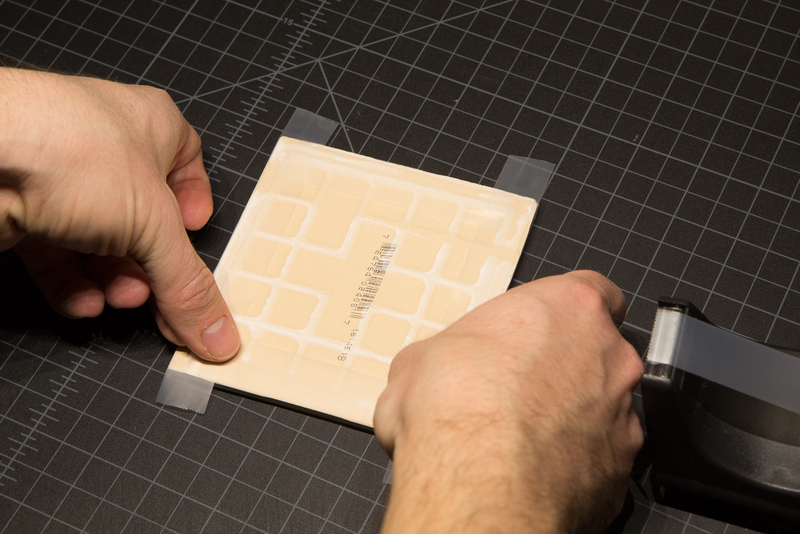 You don’t need to over-do it with the amount of adhesive, a thin coat will do. 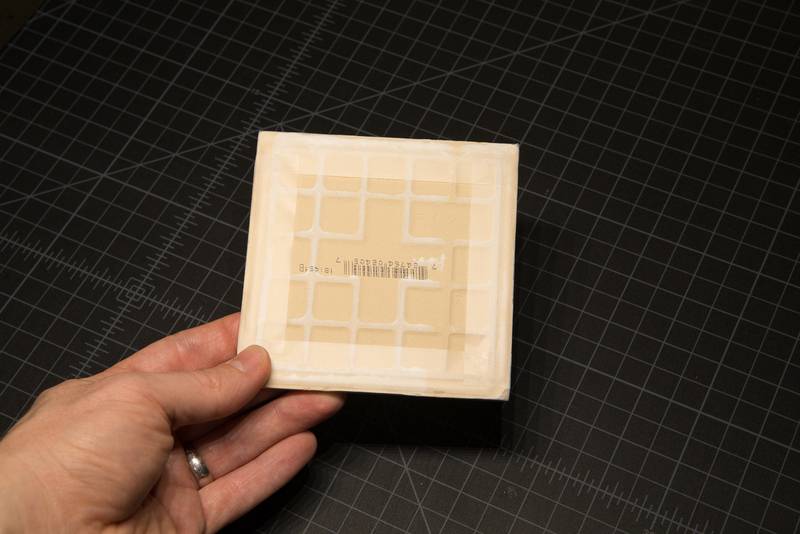 Step 5: Place photo on glued surface. 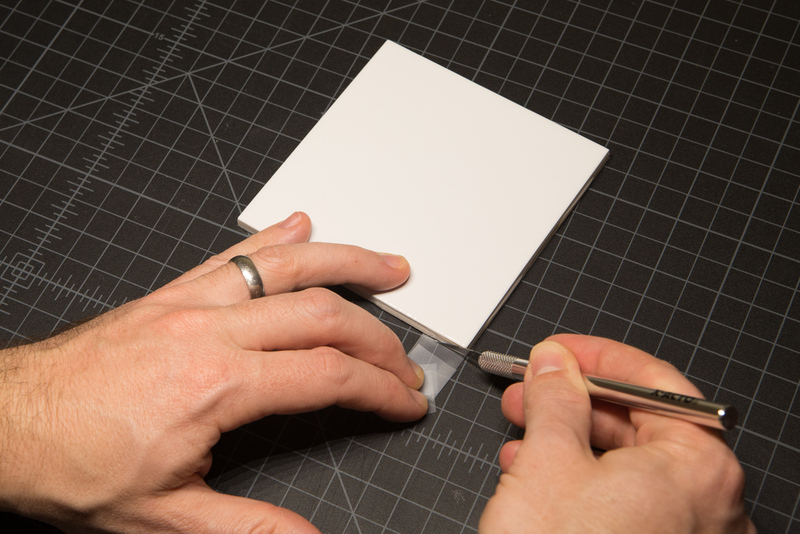 Gently lay the print onto the glue being careful not to get finger prints on your image. Use a clean 4” or larger roller/brayer to remove bubbles underneath. This is extremely important – the less bubbles now, the easier the resin curing process is later. Try to avoid getting glue on the surface of the image also. 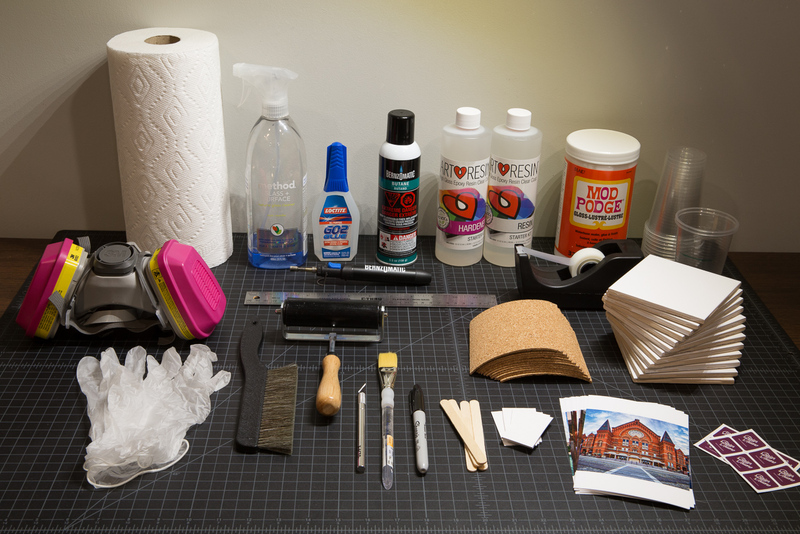 Quickly wipe off excess glue from roller with a clean paper towel before going to the next photo application. If necessary, gently reposition print to center on tile as it may shift while rolling. Step 6: Remove excess glue on the edges of the photo after rolling. This will save time later when trying to eliminate bubbles in the Resin process. With your 1” brush, carefully go around the edges of the photo and remove the glue that squirted out from behind the pressed print. Step 7: Allow time for glue to dry. Follow the directions for the adhesive type you chose for the previous three steps. I’ll often give my tiles 24 hours to dry when using Mod Podge even if it’s set in about an hour. I like to be certain! Don’t forget to wash your glue brush with warm soap and water if you plan on using it in the future! Step 8: Prepare Measuring cups. While your glue is drying, you may as well make use of the time by prepping for the next few steps. Using water and a standard liquid measuring cup or scale, measure the correct amount of liquid you will need for your project (see my chart for amounts/coasters). ArtResin, and other epoxy resins, are typically a 1:1 ratio. Pour the first half amount of water into a clear, disposable, plastic cup and mark the fill line with a Sharpie. Add the second half and mark the new line. Pour out the water and allow to dry, or use this cup as your template to mark other clean, dry cups if you plan on making a lot of coasters. In my video tutorial example, I’m making a batch of 12 coasters: that requires 3 fl.oz. of Hardener and 3 fl.oz of Resin. Step 9: Prepare a Resin workspace. Find a draft-less, dust-free environment, with reasonable ventilation. Lay down a piece of cardboard, newspaper, or sheet of brown construction paper to catch all resin drips. There will be drips, and once it cures, it’s very difficult to remove! Those same plastic cups you used for your measuring cups also work perfectly as resin pouring pedestals for the coasters. They raise the tiles above the work surface and allow the self-leveling resin to drip unobstructed from the taped tile-bottom. Turn the cups upside down and space them about 6” apart. Be sure your surface is level! Step 10: Prepare cork backing. 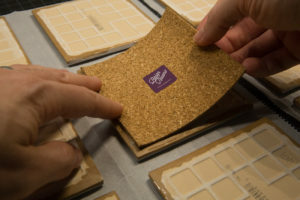 Many craft stores, like Michael’s, sell pre-cut 4”x4” cork coaster tiles, but they only come in packs of 4. To save money, if you’re doing bulk production, you may want to buy the large 24”x48” rolled sheets and cut them down into the 4×4 panels. You can save even more if you make use of their frequent 40-50% off coupons. At this stage, I add my brand logo stickers from Moo.com to the bottom of the cork. A little recognition is always nice! Step 11: Put tiles on stands. Once your glue has dried, your prints should be firmly in place. Be sure you didn’t skip step 2 and the scotch tape lining is still on the edges of the underside of the tiles! 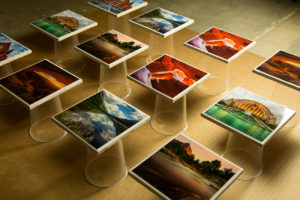 Move your tiles to the resin workspace, placing them centered, balanced, and level on the tops of the upside-down cups. Make sure you have enough space between tiles to work around the edges. Step 12: Mix the ArtResin. I’ve used several different resins over the years, and generally the process is still the same. It uses a 1:1 ratio. You’ll want the same amount of Resin to Hardener. When the two are mixed together, a chemical reaction occurs and over a few hours, the liquid turns into a solid. I fell in love with ArtResin the first time I used it. It dries crystal clear, doesn’t yellow over time, and the safety of it’s non-toxic properties are worth the slightly higher investment. I highly recommend their products and would say that (disclaimer) even if they did not send me their 32oz starter kit for this tutorial. This is a messy process even for the most careful handed. I suggest wearing rubber/latex/vinyl gloves while working with any type of epoxy resin. It’s a sticky and interesting material to work with. Using your dry, clean, measuring cup (created in step 8), pour the Hardener liquid up to the first marked line of the cup. A slow pour along the inside of the cup is best to reduce the amount of bubbles in the liquid. Next, pour the Resin into that same cup up to the second marked fill-line with the same slow pour. Try not to get any of the hardener liquid on your Resin bottle or vice-versa. And don’t mix up the lids when you go to close each bottle (I mark mine with ‘H’ and ‘R’ before opening – just in case)! With a clean wooden popsicle stick, carefully stir the measuring cup for at least 45 seconds, scraping the sides and lifting the liquid from the bottom of the cup. Stir slowly to prevent bubbles from occurring. Next slowly pour the liquid from the measuring cup into another clean plastic cup. This helps turn it over and mix it more evenly. Again, take that previous wooden popsicle stick (or a new, clean one) and continue stirring slowly for at least another 45 seconds. You’ll notice that throughout this process, the haze in the mixture has become clear. Some tiny bubbles may have occurred during mixing, no need to be concerned about those tiny bubbles, you’ll just want to minimize their presence. 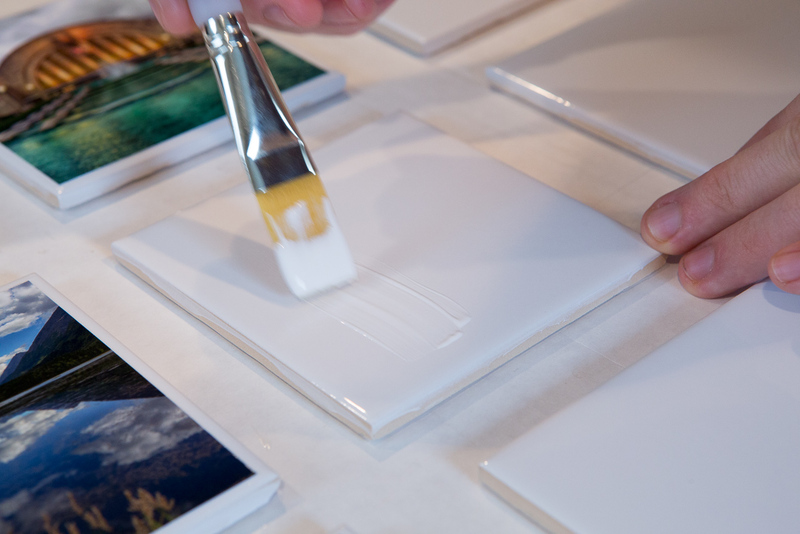 Step 13: Pour ArtResin mixture onto tiles. Divide the liquid onto each coaster by pouring into the center of each tile and moving on to the next when the resin has formed a puddle approximately to the size of a Silver Dollar (a 2” diameter circle). Feel free to discard your measuring/mixing cups after you’ve emptied them. Step 14: Spread the resin. Use a cardboard scraper (matte board cut to 1”x2”) to gently push the resin evenly over the top surface of the coaster. The viscous property of resin allows it to drag around without pressing the scraper down to the print surface. A gentle touch will do. Drips over the edges will occur and that’s what you want but try to keep as much liquid on top as possible. Carefully push/pull the liquid to coat all four edges/sides of the tile. Set the scraper down in a clean location, or have others ready to go, they may be useful again for touchups. Step 15 A: Removing bubbles. A small butane pen torch, or Artist’s Torch, works perfectly to lift bubbles to the surface of the resin. Using the heat of the pen torch slowly wave it about 1 to 2 inches above surface (avoid touching the surface of the resin with the flame) to bring bubbles up and they will pop fairly easily. It’s like magic… or science! Return every 30 minutes or so and check for bubbles. I’ve found that after around 7 hours, the bubbles become too trapped in the hardening liquid to remove. Be diligent. Step 15 B: Removing dust/lint/hair. Depending on the environment that you are creating these coasters, tiny specks of dust/lint/hair may float down on to the perfectly shiny surface of your resin as it’s curing. Early in the curing process, while the liquid is still able to be manipulated, you can easily remove it with the scraper tool. Sometimes the pen torch will work to help resettle the distorted area. Placing a clean box over the coasters as their curing can sometimes help, but every time it’s lifted up to check for bubbles, the suction can pull more dust onto the clean surface. I prefer not to use a lid. Again, be diligent and watch closely over those few critical six to seven hours. Step 16: Removing the resin drops on bottom of tiles. After at least 24 hours since mixing the resin/hardener, the coasters are cured enough to handle (though the ArtResin will take at least 72 hours to fully cure). At this time, carefully remove the scotch tape on the bottom of each tile. It’s easier to do this before they fully cure to make tape removal less difficult. Wearing a powder-free rubber/latex/vinyl glove on one hand will prevent fingerprints on the top portion. 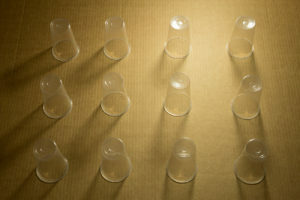 After removing the scotch tape, set the coasters back down on their cup pedestal and allow them to dry for a few more hours. Transfer tiles to a clean surface, if it has not been at least 72 hours since resin application, do not place anything (cups, mugs, other tiles, etc) on top of the coasters. Step 17: Applying cork backing. Once coasters are fully cured, place them face down on a clean, dust-free piece of parchment paper. You’ll want a strong glue to keep the cork from falling off; I use Loctite Go2Glue because it’s shock, water and temperature resistant – perfect for a coaster! 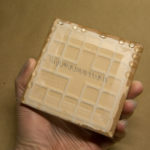 The ceramic tiles I use include a raised pattern on the bottom, I apply evenly along those ridges to maximize coverage. Press the cork backing down with a weight slightly heavier than the tile itself. I like to use one or two damaged or unused tiles to cover the surface evenly. However, a small stack of books will work just as well. Allow about 10 minutes for glue to adhere before flipping the coasters back over. If it’s been more than 24 hours, but less than 72 hours of resin curing, allow the tiles to sit for a few days. I hope you found this explanation of my process to be simple and helpful! Please let me know if you have any questions or comments (or suggestions!) about my process and I’ll be glad to help! Hopefully it goes without saying: knives are sharp, flames can burn, and chemical vapors can cause brain and nerve damage. I certainly encourage arts and crafts with kids, but be mindful of the tools and materials you are using in your household. Read the precautions on labels and follow instructions carefully. The all-purpose cleaner being used in this tutorial is non-toxic and derived from natural ingredients. Mod Podge is non-toxic, but has a distinct odor which can give headaches to someone who is sensitive to certain smells. ArtResin (unlike other epoxy resins) is No-VOC, no-fumes, non-toxic, food-safe and conforms to ASTM D4236 (safe for Home Use). The Loctite Go2Glue requires proper ventilation. Butane torches can cause severe burns and off-gas harmful chemicals. If I’m producing large quantities of coasters throughout the year, I make a point to wear a vapor mask during all liquid chemical applications, despite their labeling. I want to be able to remember my child’s childhood when I’m older. Better safe than sorry! Disclaimer: I link to several products below for your convenience and many are connected to my Amazon affiliate program. It sends a few pennies my way if you decide to make a purchase with them. Also, I’ve used several different Epoxy Resins over the past few years, but I’ve been using ArtResin exclusively since discovering it in early 2016. Their company took notice and reached out to me, asking if I could provide a description of my process. They sent a 32oz starter kit to use for this article. Thanks, ArtResin! WOW! Wonderfully explained tutorial with step by step instructions and pictures. And good inside tips! I may even be capable of doing this. And my confidence is just from reading the How To. Just wait until I watch the video. Thanks Brian. This is exactly what I have been looking for to bring in more photography product to my store. Thank you for the great video, and awesome written directions! As soon as more Michaels coupons come in, I will be there! Thanks! No problem – I hope it goes well! Let me know if you have any further questions! What a great tutorial Brian thank you! I have a laser printer would that be an issue? It should be fine, though you may run into increased bubbling during the curing process depending on the paper you use. The resin may also ‘soak’ into a standard printing paper. I would try it and see what the results look like! Hi! I have recently been making coasters just like these with photographs and other upcycled materials, and they make great gifts/products. I have run into a problem with glasses sticking to the coasters but not beer bottles, plastic cups, or ceramic products. The epoxy resin has been mixed well and is not tacky to the touch. Have you run into this problem when using your coasters and do you have any suggestions for how to solve it? Occasionally, I run into the same situation with different types of glasses. I think it’s just condensation and a suction that is created on the bottom of the glass that causes it. I’m not sure if there is a good solution for it, unfortunately. This gives such a clear explanation of using resin on tiles. I found it most helpful and informative. I have used low viscosity resin on ceramic tiles and while the cups do not stick to the tiles, they do leave rings which I can’t remove. Would using medium viscosity resin be more suitable for this purpose? I would be most grateful for any advice you can give me. I have not run into that issue. It may be that a medium viscosity resin is less runny and stays where intended. You may want to give it a try. I know Art Resin offers a small sample kit for sale for just that purpose. I hope it helps! Hi Brian 🙂 First of all, I really wanted to say that I just love your tutorial. It’s clear, extremely informative and just delightful to read (and watch!). In my coaster making beginnings, I was coming back to it everyday and each time I was finding something new to focus on. It helped me a lot. Really, really well done. And now time for my question 🙂 I’ve been trying to create 200% perfect coasters for a quite a while now and unfortunately, I’ve never gotten to this point- either my coasters end with a tiny dusty piece in the resin, or there are some microbubbles in it. Just wanted to ask how do your coaster come up? Are they totally flawless or maybe you also get some tiny bubbles in them sometimes? I’ve never managed to create a coaster with not a single bubble in the resin, so I’m just curious about other people’s results 🙂 I also use ArtResin, just to tell. Hi Kasia, thanks for the kind words! I’ll say it does take a lot of practice to get good at it… I have a few thousand under my belt at this point. When I first started I was consistently getting about 60% yield which left me with a lot of unsatisfactory and unusable coasters. At this point, I’m closer to 98% yield. With an occasional tile that just didn’t want to be, whether from a bubble or dust or hair. A few tips I can suggest: Limit yourself to small batches. I still only make batches of 12 at a time. Try to reduce the glue along the edges of the print to be as minimal as possible – that is the biggest culprit for creating bubbles. Also, be diligent while the tiles are curing. It can require several hours of babysitting to make sure they are dust/bubble free. A small artist torch is very useful and you’ll get better at it with practice – it does take a certain gentle touch. And lastly, be considerate of the temperature, airflow and movement in the room you are curing in, just walking into the room, opening a door, or AC/Heat vent can kick up dust and other debris. Wearing a vapor mask, aside from the safety benefits, can help with directing and muffling airflow while you’re working. I hope those tips help and let me know if you have any other questions! Happy coastering! 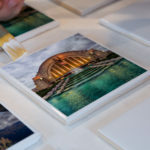 I have just started making coasters with my photos but I’m using wood instead of the ceramic tile. Do you think the tile has advantages over using wood? This is a great tutorial. One I plan to keep as my step by step. Thank you for taking the time to do this. Thanks, Jean! Experimenting with other materials can be a lot of fun! I would guess that the porous feature of wood may cause a lot of bubbles in the curing process. But it will likely depend on the type of wood, smoothness of the surface and possibly sealing of the wood with another method. Worth trying of course! Good luck and let me know the results!